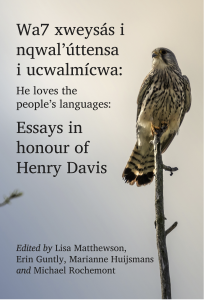 Welcome to the UBC Linguistics webstore. Here you can purchase print volumes published by the UBC Occasional Papers in Linguistics, as well as previous volumes of UBC Working Papers in Linguistics. You can also order digital resources for UBCWPL and OPL, including audio files; all digital files are free to download. For information on who we are, shipping, or resources for authors, click the dropdown “About us” in the navigation menu above. If you would like to order a physical copy of a backlisted volume, please contact us first to check availability.